What could be prettier than raspberry preserves in an old-fashioned jar? Instead of taking flowers or wine as your next hostess gift, try this amazingly simple and amazingly delicious recipe. Just don't tell anyone how easy it was to make! This is a recipe by Miss Edna Lewis, a legendary southern cook and granddaughter of slaves. Watch a documentary about her called Fried Chicken and Sweet Potato Pie here. I read the recipe in one of my favorite cookbooks, The Splendid Table's How To Eat Supper by Lynne Rosetto Kasper and Sally Swift. Lynne hosts The Splendid Table, a wonderful radio program on NPR (National Public Radio) in the United States. Although I live in England, I can still listen to the program by downloading the free podcast- oh, the joys of technology. First start with 2 cups of raspberries and dump them in a bowl. Actually, use any amount of raspberries you'd like. You'll see why in a minute, I told you this is simple. Next add 2 cups of sugar or if you dumped in 3 cups of raspberries, add 3 cups of sugar. Yes, just equal amounts of rapsberries and sugar. It couldn't be easier. Now mash it together with a potato masher or two forks. Don't put it in a food processor, you don't want to crush the seeds. 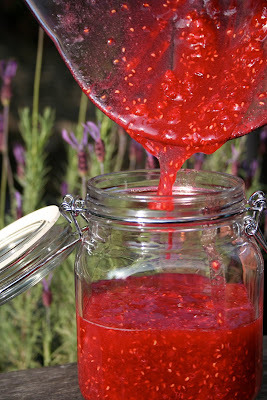 Pour the preserves into a pretty jar. It just doesn't get any easier or prettier than this! Ok, let's recap. Equal amounts raspberries and sugar. Mash it and pour it. Put it in the fridge and don't touch it for 2 days. This allows the sugar to completely dissolve. Now here comes the best part. It keeps in the fridge for a year, yes, a whole year if not longer. And because the fruit is not cooked, it always tastes incredibly fresh. Serve it on southern biscuits, scones, toast or how about on vanilla ice cream? It tastes great served alongside roast chicken, too. But my very favorite way to eat Miss Lewis's sugared raspberries is on a lovely peanut butter and jelly sandwich. Jealous, yet? Oh my God, a whole year? This is such a great recipe. I love how the steps are presented. it is as if a teacher is talking to us. Thanks, Valentina. Yes, a whole year and they always taste like fresh picked!